Perfect company to work with. I've been using them for years now. Very unique product. Eco-friendly too. Thank you Custom Earth Promos. Top tier company to do business with. Brilliant idea. Can't wait to place another order with CEP. So many people would just through away and old door hanger. This allows people to be more conscience of our earth, and allowed us as a company to promote ourselves in a great way. Awesome idea for door hangers! Really makes a unique outlook on a business! Cant wait to order more from this company! Perfect company to work with. Great product line thanks for your help Custom Earth Promos. Cool product I use Custom Earth Promos for all my orders. Customers will surely remember you using these seed paper door hangers. A unique way to promote our company that we really liked. Helping the "going green" cause is important to us, so it was a purchase that really made sense. Very nice that this company offers a wide variety of different seed mixtures with this product. I was able to use this seed paper door hanger to its maximum marketing capabilities. I placed my logo on the front and one of our company phrases on the back. It seams insignificant, but having several different printing options is a big deal to me. We thought this was a good way to promote our company and be eco-friendly at the same time. The print quality and color are amazing. I recommend inquiring about the add ons available. There are defiantly some good ones. Awesome that this whole seed paper door hanger can be planted, and eventually bloom. We appreciate that these seed paper door hangers are made out of 100% recycled paper stock. There really is an abundance of seeds embedded in each door hanger. Great quality. Custom Earth Promos presents the Seed Paper Door Hangers collection, an eco-friendly solution to driving your door to door sales or marketing campaigns. This "green" promotional product will give your brand a competitive edge in the current "big green opportunity" for businesses. Custom design an exclusive order of door or mirror hangers with one of our in-house expert design experts. We'll work with you to determine which customizations will best capture your brand aesthetic and eco-optimize your ad campaign. Orders include full-color printing on one side. This collection is a proven favorite for door-to-door marketing and customers in hospitality looking to promote their eco-responsible core to guests. Eco-friendly door or mirror hangers are a budget-friendly and highly effective strategy to broaden your customer base and invest in your brand image. Invite customers to join you in the fight for a sustainable future after they've enjoyed their stay or discovered the marketing material on their door. Instruct guests or customers to leave their Seed Paper Door Hangers in water overnight and plant under a thin layer of soil. With daily water and adequate care, wildflowers will begin to sprout as a living reminder of your eco-friendly initiative and ethical brand in just 1-3 weeks. The creative collection of Custom Earth Promos Seed Paper Door Hangers is made of 100% post-consumer recycled paper. Custom colors and graphic imprints are rendered with only all natural, soy-based pigments. Promote your eco-friendly business and establish your presence in the form of vivid and colorful wildflowers. 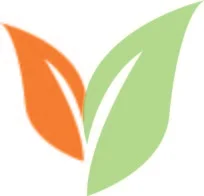 The all natural product construction and guaranteed growth will earn the admiration and appreciation of eco-conscious customers, increasing brand value and word-of-mouth advertising. Work with your design expert to build a custom design that captures your current campaign or upcoming event's theme. 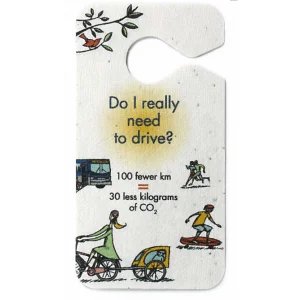 You can also use the available imprint space for socially responsible messages that will benefit your brand value, such as thoughtful messages of "Drive Less" or "Don't Text and Drive" campaigns. Unlike regular door hangers, Seed Paper Door Hangers from Custom Earth Promos offer customers a disposal method that benefits the ecosystem. When wildflowers bloom, they will help to promote the growth of the surrounding foliage and improve air quality. Give customers and prospects a lovely mix of wildflowers to remember you by. No matter what type of business you're in or which sector you serve, building an eco-conscious brand image is vital to its future success. Our seed paper door hangers provide an affordable and effective tool for promoting your brand's devotion to sustainability. All Custom Earth Promos products are California Proposition 65 compliant, guaranteed to be free of any harmful metals or contaminants. Custom Earth Promos proudly manufactures the highest quality seed paper in the industry, handmade in the USA and renowned for its rich texture and superior germination rate. Only USDA-approved, non-GMO wildflower seeds that exhibit highly successful germination are used, ensuring top quality standards are met. A paste of 100% post-consumer recycled material is infused with our top-performing wildflower blend of Sweet William Pinks, English Daisies, Spurred Snapdragons and much more. The seed infused paste is then laid out to dry in large sheets at our 30 kW solar-powered facility. Each phase of production is carefully monitored to ensure maintained seed integrity and germination. There are several custom seed mixes available. We offer an "Evergreen Mix" for winter promotions and a "Halloween Mix" of pumpkin seeds to add spooky style to October promotions. Our experts can even create a custom mix for your order with seeds that produce a specific color of flower or set of flowers. This empowers our team to capture your brand aesthetic through both the Seed Paper Door Hangers and the gardens they will recycle into, optimizing your branded eco-friendly exposure. Offset, digital, letterpress, and inkjet printing methods are available. We'll consider your design goals, quantity and time restraints to select the printing method that is most effective for your design blueprint. Our superior printing procedure and earth-friendly inks ensure that seeds remain intact during the production and printing process. Customize your order of Seed Paper Door Hangers with attractive designs to support your eco-friendly brand initiative or spread awareness for a responsible cause. The full-color imprint of your brand name and logo will be printed in high-resolution for maximized visibility and eco-attractive appeal.